Home / News / Local News / Chestermere’s History–on your doorstep! Volunteer week is over but there is no end to celebrating the gift of time given–and Chestermere Historical Foundation (CHF) is now benefitting from the generosity of those who helped with our recent casino. 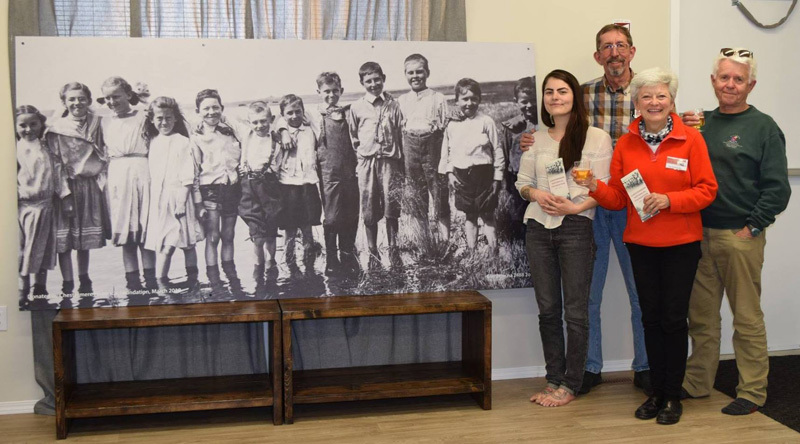 From this beneficence there is now a beautiful 4′ x 8′ mural of Chestermere school kids, c 1913 on the wall at the ReidBuilt Centre for Community Living, also the home of Synergy. The mural was unveiled at the recent Synergy AGM and is there for all to see. The kids in the photo are nearly life-sized, and it is fun to see the clothing, the big smiles, and realize that fun at the lake was a big thing even then. Where would you like to seem more murals like this?